Meet Pops. 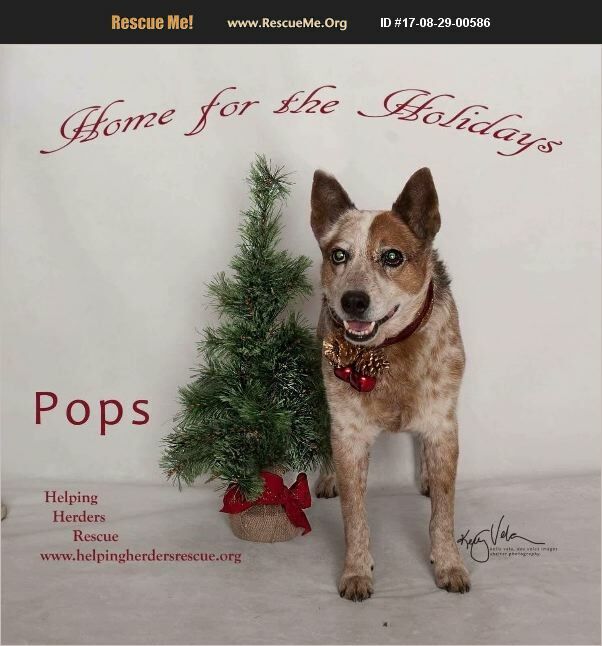 This handsome red boy is a 9-10 year old Australian Cattledog who is healthy and ready for a wonderful home. Pops weighs about 40 pounds. He recently had a full senior panel at the vet and we are thrilled to say that he god a clean bill of health. His blood work is normal His eyes are good and he has no hearing or eyesight issues. His heart and lungs sound great. His x-rays shows the early stages of some arthritis but he is getting around quite well without any pain. He is in tip top shape for a guy his age. Pops is wonderful best pal material. He is naturally well behaved��%BD��%BD%BD'��%BD��%BD%BD|like a distinguished gentleman. He is polite in the house. He just asks that you get up and let him out first thing in the morning. If so, he has no accidents. Pops is a nice guy with people. He would prefer a home without small kids only because he is ready for some relaxation rather than the innate hustle and bustle that comes with a home with small kids. He is also currently living with other dogs in his foster home and is a nice guy with them, too. We think he may be good with cats and can cat-test if requested. Pops is great on leash and he loves car rides. He would be a nice travel companion. As for special tricks, beyond being a polite and handsome boy, he sure makes treats disappear quickly! Pops is neutered, microchipped, and up to date on vaccinations. He is ready for a wonderful home in So Cal. A home visit and vet reference are required.